The objectives of this project were (1) to measure consumer satisfaction with tap water quality, (2) to investigate demographic trends in consumer satisfaction and consumption of tap water alternatives, (3) to identify the factors that cause consumers to purchase and use bottled water and POU/POEs, and (4) to develop a list of recommendations for water utilities that can improve consumer satisfaction and help bridge gaps between perception and reality. The following are highlights from the research project: Consumption rate of tap water alternatives is highly dependent on geographic location (20% usage rate in the Midwest vs. 80% on the West Coast). Tap water drinkers are more satisfied (20% on average) than tap water alternative drinkers concerning various aspects of tap water (e.g., overall quality, taste, appearance, smell, safety, healthiness). 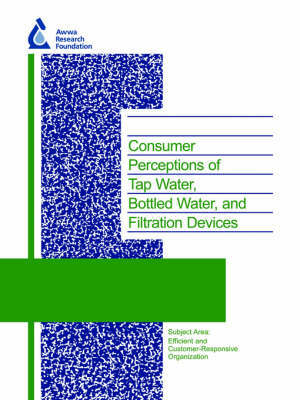 Tap water quality had limited influence on consumer satisfaction. The highest level of correlation (between satisfaction and water quality) was found to have an R2 - value of 34%-64% for hardness and total dissolved solids. Safety was the primary motivator for filtered water drinkers. Bottled water drinkers were divided between taste, safety, and healthiness.